Curbing provides a finished look to your property's sidewalks and driveways. Whether you need to repair a damaged curb or you're designing new curbs, V & F Paving is committed to quality and assurance. If you're looking to add flare to your curb, inquire about Belgian Block curbing today! 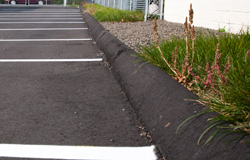 Our curbing method is guaranteed to give you the clean, protective edging you're looking for. With our project management team, all of our projects exceed client standards. At V & F we make sure all of our curbing meets grading and quality requirements. V & F curbs are done to not only meet our clients' guidelines, but construction guidelines as well. Our experience allows us to easily give you the finest curbing we have to offer. Speak to our experts today by contacting us.